Jeff For Banks: Don't let perfect be the enemy of very good in bank profitability. Don't let perfect be the enemy of very good in bank profitability. When I began my journey as a bank consultant, my firm's top-notch cost accountant repeated this post title to me often. He was teaching me the mechanics of cost allocations from support centers to profit centers in FIs, and further down to products. The key, he told me, was to develop a rational allocation method that is understandable to those being measured and apply it consistently. As FIs drill down to relationship and customer profitability, cost allocations become ever more complex and subject to greater challenges by those that disagree with the results. Usually those that disagree are responsible for relationships they once thought were profitable to the FI, but the data shows they fall short. It is easier to challenge the results than to ask "why? ", and develop an action plan to improve profitability. Even though the American Management Information in Financial Services (AMIfs) considers me a certified cost accountant, I put to you that I am not. I come from the line. I am on the line of my firm. I think more like a profit center than a management accountant. So I will not bore you with a discussion of standard versus fully absorbed costs, as I would find it incredibly boring to type, let alone ask you to read. But there is a rational, middle ground method to drill fully absorbed costs to get an individual operating cost per account. My firm's current profitability software calculates fully-absorbed average costs per account. 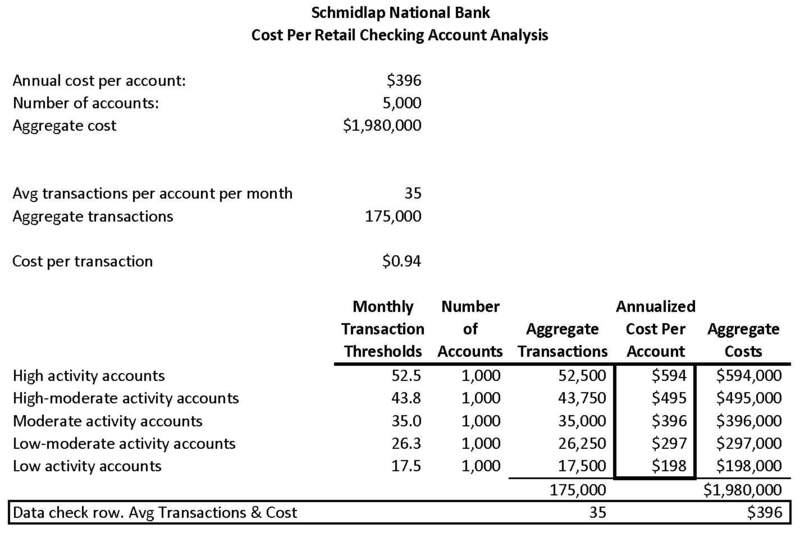 This means that if I have a checking account, and visit the teller 20 times in a month, I am charged the same cost for my account as someone that solely does 10 Internet banking transactions per month. Those responsible for customer relationship management (CRM) or other account-level profitability software cry foul. And they are right. But to get to the most exact data takes a tremendous amount of effort that will yield results that are as near to 100% accurate as possible on the day the measurements were taken, and veer from the ideal thereafter. So how can we measure cost per account that rewards low transactions or usage of low-cost distribution channels? I propose developing an easily explainable and defensible fully-absorbed cost per account that differentiates based on account usage. To do so, you must first determine the fully absorbed cost per account. For example, the average annual cost per retail non-interest bearing checking accounts for my firm's profitability customers was $396 during the fourth quarter 2010. Adding that cost times the number of accounts yields the aggregate operating expenses used to originate and maintain those accounts. If we divide the number of accounts into quintiles based on number of transactions, we develop pools of accounts to assign different costs. We then can take the "moderate" accounts, and assign the average cost per account, and increase costs for those with greater than moderate transactions and less costs for those with fewer (or cheaper) transactions (see table). Transaction counts can be weighted to differentiate between high-cost transactions, such as a teller transaction, to low cost, such as an Internet banking transaction. Your FI might estimate that one takes 3 times the amount of resources as the other, so one teller transaction counts as three, whereas the Internet transaction remains at one. In this way, the customer that does 25 Internet transactions is not charged the same cost as the one that does 25 teller transactions. The results will not be exactly correct. But there is no management information that is exactly correct. It will, however, be what one CEO termed "directionally correct". It will tell the relationship manager what customers are profitable and need to be paid attention to, and what customers are unprofitable and action must be taken to gain more business from that customer or pay attention elsewhere. This behavior, multiplied by every relationship manager and account service representative in your FI, will improve retention of profitable customers, generate positive action toward borderline customers, and focus attention on the right locations, products, and distribution channels to serve your most profitable customers. In short, it will improve your FIs profitability. How do you measure profitability or how should you measure it? Jeff - love the comment regarding "directionally correct". Simply put, the information needs to be accurate enough to make an informed decision about what action, or inaction, to take. I really like your thoughts about weighting certain transactional costs and deividing accounts into quintiles - it's more accurate than all in one pool. I tend to discuss the old law of diminishing returns - is it worth THAT much more effort to tighten up profitability 1 more percent? How will that change the decisions you would make on that information? This is a leadership issue, in my opinion. If cost per account is rationally derived, then there should be actionable results. Because of the "Art" portion of profitability measurement, those inclined to inaction have their primary objection. The leader must differentiate between objections aimed at improving data or stonewalling. As a manager, I always stressed that "90% perfect" was good enough. If it takes X amount of time to achieve 90% perfection, it will almost always take 2X to achieve 100% perfection. 100% perfect isn't operationally efficient. At 90%, you still get an "A grade" for your efforts, which is usually much better than your competitors achieve.